You will not believe it. Instant snow erupts to 100 times its volume. Makes up to 12 gallons per pound, though the actual yield may vary depending on the quality of water used. For the best results, we recommend using distilled water. It sparkles and glistens and lasts forever with only a spray of water. Make artificial snow that looks like real snow anytime of year and anywhere, a small or large amount. This artificial snow looks like real snow and can be used again and again. It is the same type snow used by movie companies. Instant snow is a non-hazardous, non-toxic, environmentally safe polymer. Kids love it and it is a great experiment. 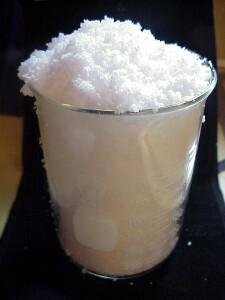 You pour water into the measured amount of snow and it will pour over the edges of the container! It is so much fun to play with and run your fingers through. It is almost mesmerizing! It feels like winter any time of year with this amazing snow. We will send a one ounce measuring device and instructions. One ounce will make 1.5 to 2 quarts of snow. You can multiply the proportions and make as much as you want! Instant snow is formulated from the same type of polymer used in baby diapers called sodium polyacrylate. Online Science Mall received dozens of samples from various manufacturers before we chose the best one. This is so much better than other fake and artificial snows. Our Instant Snow quickly expands to many times its initial volume in seconds. Also, we judge this to have nice snow like consistency and white color. This is often used as a special effect in movies, television and photography and will not harm plants; it will actually help them because of its water holding properties. Snow starts as a fine white powder and when activated by common tap water will expand up to 100x its original volume. One ounce (measure included) will produce up to two quarts of snow. (Hard water will produce less; distilled water will produce the highest volume). If you have any questions about this product by Emerging Technologies, contact us by completing and submitting the form below. If you are looking for a specif part number, please include it with your message.